As music booms from speakers and lights flash around the bustling Garden Bros Circus ring, hidden behind a curtain is a much more solemn scene. As noisy dirt bikes dart around the ring, two elephants stand huddled together behind metal barricades, swaying their heads and trunks back and forth in fear. Audience members cheer and clap from the grandstands, unaware of the animals suffering just feet away. During the daily shows, the two female elephants, named Isa and Viola, are forced to perform for the loud crowds while wearing flashy costumes. But the rest of the time, they’re ushered behind the curtain to cower over the ear-shattering noises of the other performances. For the past 50 years, this has been their everyday life. The new video was filmed by Animal Defenders International (ADI) during a March 23 performance in Broomall, Pennsylvania. 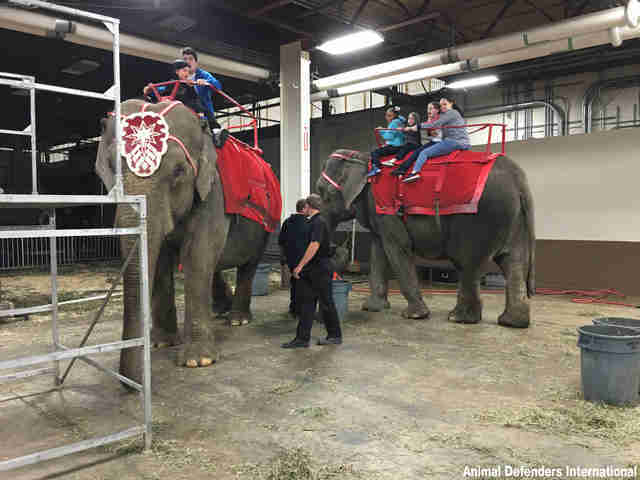 The Garden Bros Circus, which travels across the country throughout the year, has a record of tasering and beating elephants with sharp metal bullhooks during training sessions. In 2014, ADI was on-site to witness Isa lash out from stress and attack another elephant during training in Utah. Despite the conflict, she was still forced to perform and give rides to children that same day. 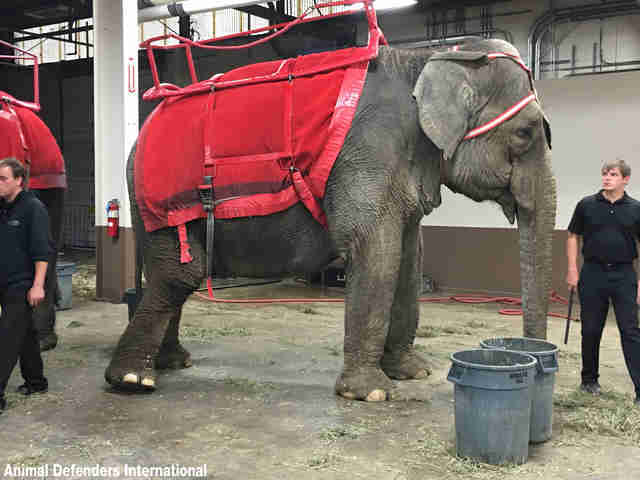 Both elephants, who were taken from the wild when they were babies, have made multiple attempts to escape their circus enclosures. Isa was born in 1970 and captured a year later, while Viola’s capture date is unclear. The swaying behavior shown in the video, known as stereotypic behavior, is a sign of extreme stress, and is often seen in captive animals. To cope with the cramped living spaces and lack of enrichments, captive animals may also be seen obsessively pacing around and rubbing the sides of their enclosures. “The restricted space these elephants have to move around in is causing them mental and physical distress, resulting in the abnormal behavior seen in the footage,” Jan Creamer, president of ADI, told The Dodo. 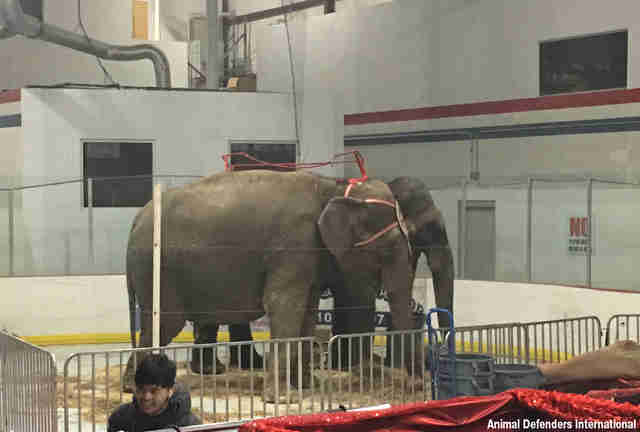 Now, ADI is urging animal advocates to express their support for a federal bill that would ban the use of wild animals in traveling circuses, and help countless animals just like Isa and Viola. 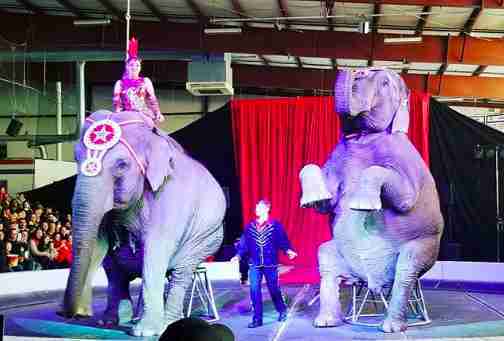 To help circus animals, you can learn more about the bill here. To support further investigations, you can make a donation to Animal Defenders International.